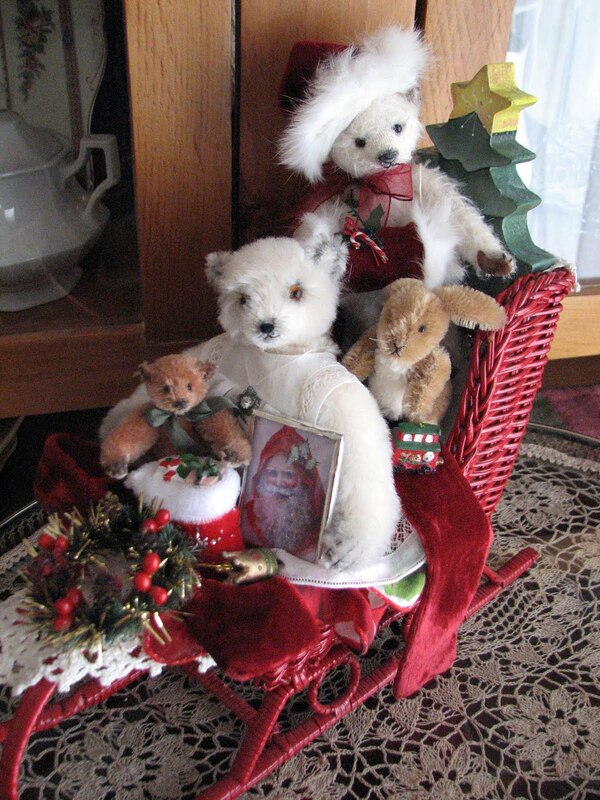 Each year I try to come up with an interesting Christmas display for my Artist Teddy Bears. This year I put all my "Brendie Bears" in a red Christmas sleigh. My Aunt, Brenda Power, is a very talented and creative woman. 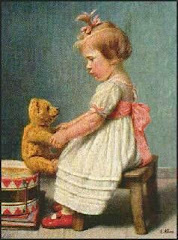 She makes miniature Teddy Bears, Bunnies and Jewellery just to name a few of her talents. You can visit Brenda's blog here . These bears are all ready for the snow . . . not so sure I am, LOL. 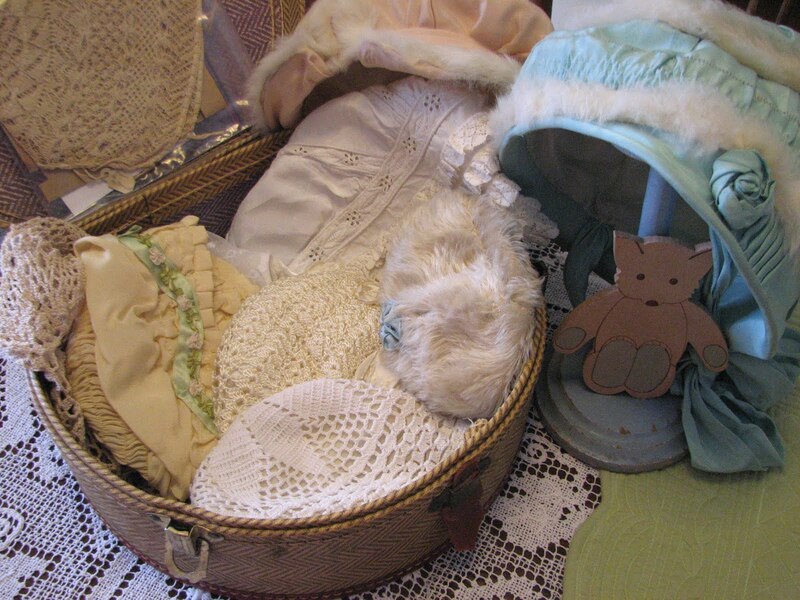 This week I will be listing some wonderful children's hats and baby bonnets in my Old Soul Bears Etsy shop. 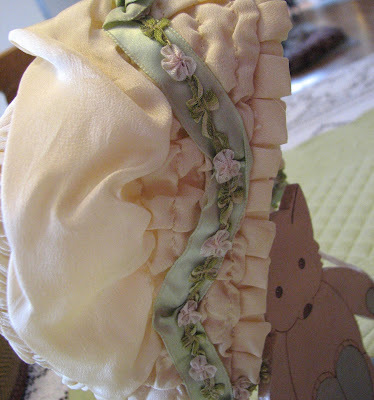 They look great on display or can be worn by Dolls or Teddy Bears. I just love the ribbon work on this one! The silk is still in perfect condition. This blue bonnet will be hard to list . . . I have avoided listing it for a year now . . . and it didn't seem to make it to the vintage clothing show either. 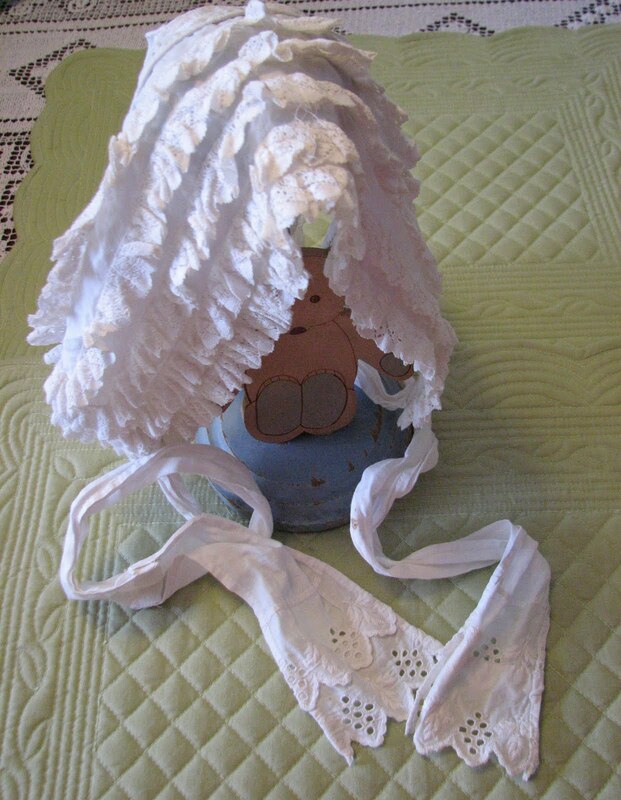 The ruffles on this Victorian bonnet are in great shape, as is the white on white embroidery. Well . . . I should get back to my listings. Have a great week and thanks for dropping by ! They say if you love it let it go, and if it was meant to be it will come back to you.. But!!!! If you love that blue bonnet so, and i would, if i had it, Don't Sell it.. you will regret it. It is beautiful.. All of them are. Oh wow - the one with the ribbon is to die for! I love it! OMGoodness! That silk one with the crochet is absolutely gorgeous! Oh, I would love that one and to have a beautiful porcelain baby doll to put in on and display her in an antique wicker pram with some tatted goodies...wouldn't that be so pretty? OH! Hi Karen, all of them are just beautiful. I especially like the one with the ribbon on as well. I hope you are well. we got some snow today, so this is probably here for good now. take care. I think of you often. Oh what lucky babies those were to have worn those. They're just beautiful! your miniature bears are to die for!! What a great job your Aunt did!!! She's so talented with miniatures!! 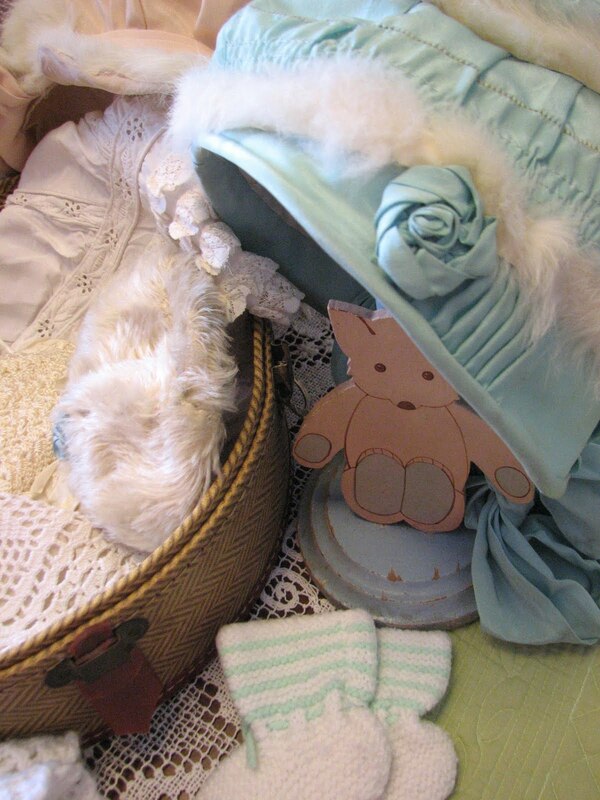 Your display is fabulous... and the baby bonnets too! I had a sneak peek at your Etsy, ooohhh I sooooo love Terra!!! This antiqeu is so beautiful. The bears are adorable in the sleigh:). 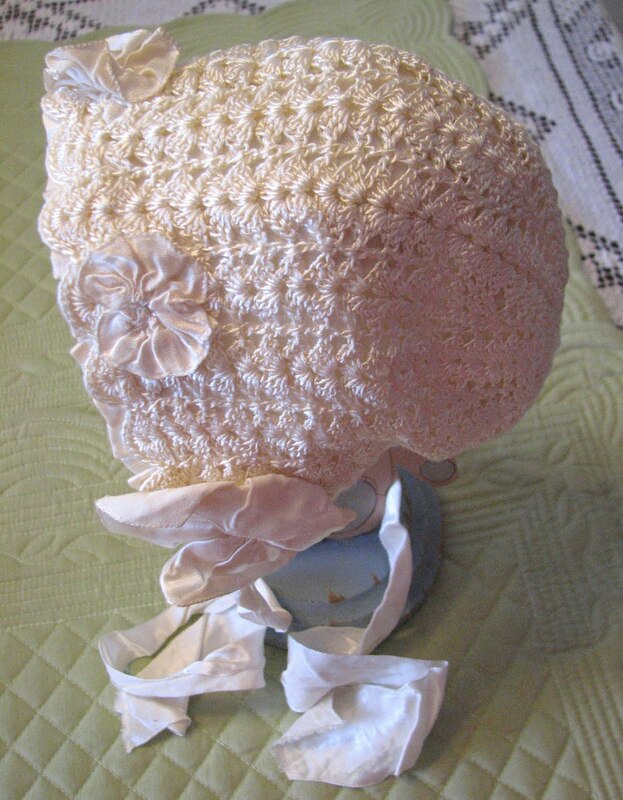 All of the bonnets are lovely too! Hi Karen...Oh, I just love your collection of Brenda's bears. They are wonderful...and the sleigh is perfect for them. The little hats are very pretty...darling additions to a "hat" collection.